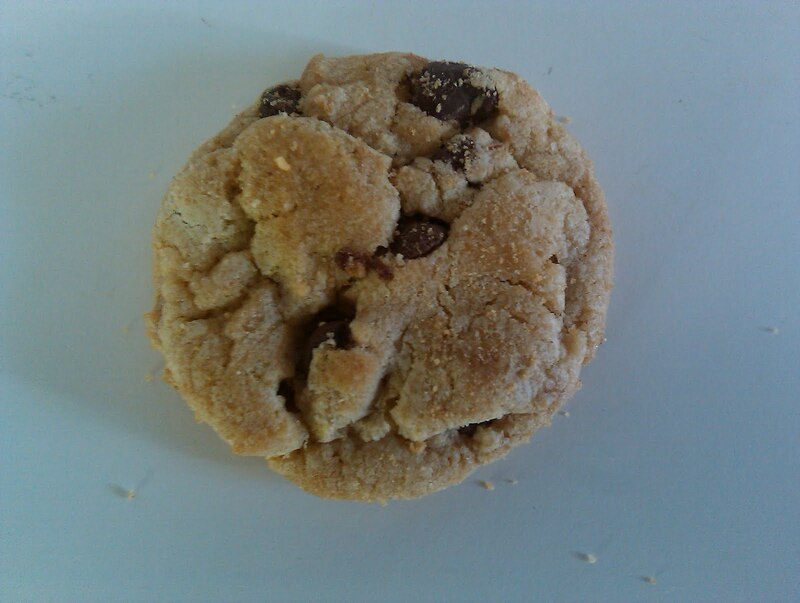 Look at how beautiful this cookie is… You know, it was a real chocolate chip cookie. One that tasted as if shortening was an ingredient (I don’t know if it was though). Nabisco’s Chips*Ahoy can’t hold a candle to this man’s cookie skillz. I’m going to have to get that recipe! Actually I know she reads the blog so maybe she can post it in the comments? Chocolate chip cookies are the perfect food! Your daily allowance in circular formation: grain, dairy, chocolate (that is a separate category, right. :) They look fantastic! oooooo….I am hoping she will share that recipe with us! A balanced diet is a cookie in each hand 😉 I like to think a chocolate chip cookie in each hand! You need to invite them over and offer them to use your kitchen, so you can eat them warm out of the oven. Or…are you having a birthday soon? Cookie dough freezes really well! You tell me of a PERFECT cookie and yet fail to tell me how I can eat it. My computer cannot yet print food from pictures so now I mope. I wanted to share something with you. My little boy loves to watch old episodes of a show called Emergency! which aired in the 70s. One episode, called The Smoke Eater (http://www.hulu.com/watch/59800/emergency-the-smoke-eater) features something I have never, ever seen before. A fruit vending machine! It had apples, oranges, bananas, pears, and something else I couldn't tell what it was. Apparently they used to have them (but obviously not anymore.) Wonder if we can bring them back? That cookie looks almost as good as the ones I bake. It must've been pretty tasty, if that's the case. The cookie was so, so good. I'm living the good life for sure! um. a secret between you, her and your other three thousand readers perhaps? I need about 10 of those cookies right NOW 🙂 Oh and I would love to see this fruit vending machine Milehimama is speaking of…they need to bring those back ASAP!! Was at a meeting the other day, a REAL Cheese Torte…that was So So Very good and a plate of these chocolate chip cookies that looked great. Until you took a bite of one and you could taste that they had come from the local store bakery. You know that taste…they looked oh so perfect, but those cookies they didn't live up to my expectation. Now I'm jonesin for a REAL chocolate chip cookie no preservatives added please. they wont last long enough anyway. Ummmmmm! A chocolate chip cookie… Simple treats seem to be the most satisfying. Maybe that's why I have so much trouble stopping at just one! Shortening?? I hope the non-hydrogenated kind. Or better yet, butter. Actually, they do have fruit vending machines now. One day, I shared the school elevator with a delivery guy who had a huge cooler he was bringing into the building. I kiddingly asked if there was a body in it (to give you a sense of the size). He said, "No, actually, it's fresh fruit to refill the vending machines in the cafeteria." I expressed surprise that we had such a thing, and he told me that it was quite popular, based on how frequently he comes to stock it. A few days later, we had a faculty breakfast on a staff development day where no kids were in the building, so we used the students' cafeteria. I got a chance to see the machine, though it was from a distance. I meant to take a closer look, but got involved in some conversation, and then had to run to a meeting. From what I could see, it looked like pre-packaged cubed watermelon and cantaloupe, and the like. I'm not sure if there were whole pieces of fruit, though. If I have a chance, I'll try to stop by in the next day or two or three, but if not, it will have to wait until the fall. I hope it will still be there. my hubbie is a chocolate chip cookie baker too (yes I married him for that reason alone).. sadly I only get them at christmas time when we bake dozens upon dozens! Chocolate chip cookies are my favorite food ever and I'm on a constant quest to find the best one. Please please get this man to let you share the recipe on your blog! I love chocolate chip cookies. Fav. from a place when I buy them – Subway – so nice and gooey and just YUM! Made with SHORTENING? YUCK, GROSS! And you're going on about people eating good food? That stuff is DISGUSTING. I agree with Jenni-I was hoping the recipe had been posted as well. My boyfriend does the baking in the household-he's definitely one to keep around-his oatmeal chocolate chip cookies and pumpkin bread are to die for! So my friend emailed me the recipe. Thanks for your patience!